Reading the correspondences of Kan Chieh-hou, aide to the deposed president of the Republic of China, Li Zongren. When the Nationalist Party retreated to Taiwan in late 1949, the President of the Chinese Republic, Li Zongren, wasn’t there. He was as far away from China as he could almost possibly be. Residing in New York City with a small team of loyal staff, Li’s distance from the scene of the Guomindang collapse reflected the infighting then ongoing within “Free China’s” anti-communist forces. Unity was hardly visible, even if the face of imminent defeat by China’s Communist Party. In fact, defeat exacerbated the fractures within the Chinese Republic. From an office in the Waldorf Astoria, Li Zongren and his personal representative Kan Chieh-hou (甘介侯) ridiculed and criticized Chiang Kai-shek on a daily basis. Simply by presenting themselves as the leaders of “Free China” (a tenuous claim by early 1950), the two men undermined Chiang’s authority. They did this often with American audiences, most famously during a luncheon on March 2, 1950, with U.S. President Harry Truman. 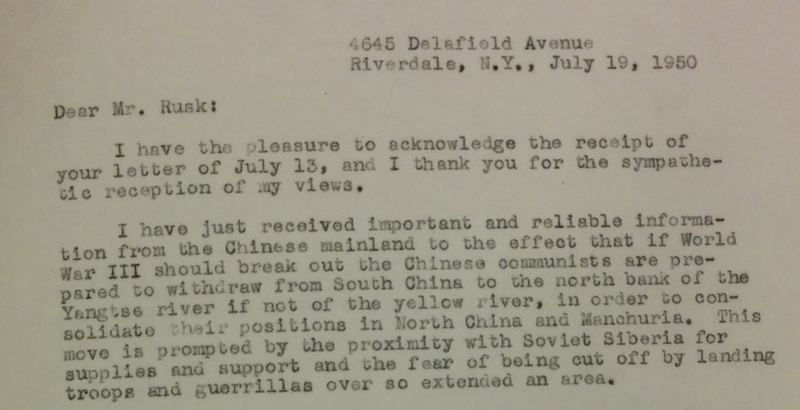 They regularly wrote letters to career diplomats and other State Department personnel to discuss Sino-American relations and disparage Chiang. This campaigning did not matter much in the end. Chiang Kai-shek won the battle against Li. He became, once again, President of the Republic of China, just a few days after Li dined with Truman. Li and Kan relocated to an address in the Bronx, doing everything in their power to avoid becoming irrelevant. In particular, they kept on writing letters to diplomats, pleading their case and attempting to elicit support and sympathy from the United States Government. Their letters, accessible in Columbia University’s library, reveal that the two exiled officials were as adamant as Chiang Kai-shek to return to the mainland—though they wanted to do so at Chiang’s expense, not in cooperation with him. The withdrawal of the People’s Liberation Army to areas north of the Yangtze River would offer breathing space to anti-communist guerrillas. They could then come together in southern China under a unified command–undoubtedly Li Zongren’s, in Kan’s mind. Kan knew that if such a situation were to arise, Chiang Kai-shek would try to return to the mainland immediately. He pleaded with Dean Rusk not to consent. The Chinese people feared, Kan bemoaned, “the return of Chiang Kai-shek…with his dreaded 400,000 armed men together with corrupt officials, party runners, secret agents, and office hunters.” Kan wanted America to use its power to stop Chiang. Kan’s salesmanship was often dramatic. He described this hypothetical situation as a “tragedy,” one which would “go down in the history of China.” So he proposed an alternative plan to Rusk: if the United States supported an “enlightened organization” to retake the mainland, it could win the hearts-and-minds of the Chinese people–no doubt Kan had in mind an organization led by Li Zongren and himself. In a January 5, 1951, letter to O. Edmund Clubb, Kan continued to advocate for a return to the mainland. “To the confused mind, to aid China is to aid Chiang Kai-shek,” but that does not need to be the case, Kan contended. He had plans to retake China without the involvement of Chiang and advised the United States to help by “[fomenting] widespread turmoil, disruption and insurrection” in Communist China, principally by supplying guerrillas in Southwest China and Southeast Asia. Kan had thought this idea through. With French Indochina serving as a gateway for freedom fighters to cross into China, Kan believed “the whole situation [can] be changed overnight.” (Kan was apparently unaware of the extent of China’s support for the Viet Minh in northern Vietnam, however.) If troops marched into China from Vietnam, Kan said that Li Zongren was prepared to send commanders to Yunnan, Guangxi, Guangzhou, and Hunan. (Kan insisted Li was still acting president of the Republic of China.) From these locations, Li could take control over an allegedly vast guerrilla and anti-communist movement. Kan supplied Clubb with maps and other detailed troop information on the guerrillas to support his claims. In his mind, none of this was hyperbole—Mainland China could be won back, and quickly. It is not clear whether or how O. Edmund Clubb responded to Kan’s anxious inquiry. Clubb was chief of the China Desk, but it was the McCarthy era. Like many other China hands, he was under investigation and would eventually be forced to step down from his post. He may not have had time to seriously consider Kan’s plotting. 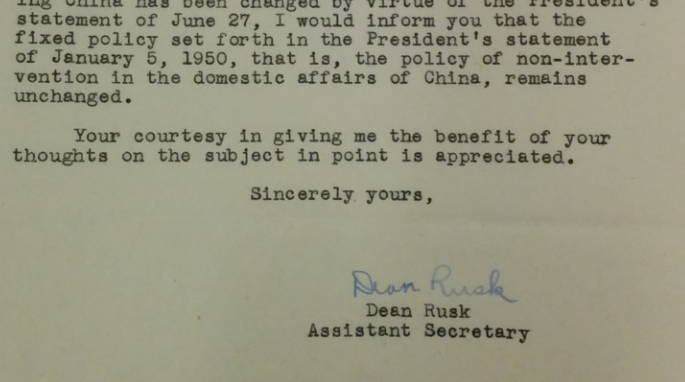 Dean Rusk, on the other hand, was dismissive. He had told Kan earlier that the U.S. “policy of non-intervention in the domestic affairs of China, remains unchanged.” An invasion plan, one which cut Chiang Kai-shek out of the loop, was out of the question. Having received Rusk’s terse response, Kan Chieh-hou granted that even he was “inclined to think that a world war is unlikely.” The opportunity to storm into the mainland might not materialize as Kan fantasized, but it still couldn’t hurt to be prepared, could it? The information and quotes above can be found in Columbia University, Rare Book and Manuscript Library, MS#0779, Li Tsung-jen (Li Zongren) Papers, Box 3.